TAKE A BOLD STEP TOWARDS HEALTH EMPOWERMENT. After years of struggling with my own health concerns, and not getting the help I needed from conventional allopathic doctors, I studied herbalism and western medicine, and learned how to heal myself. In 2008, I realized that the psychological aspects of my care were not being addressed, and so I started working with a life coach and started to realize that the stories I was telling about my own health, body and life were getting in the way of my feeling my very best. A few years later, medical degree in hand, I started working as a primary care provider, with the dream of supporting my patients to make real and lasting change. It soon dawned on me that the system is broken – that the short, infrequent visits my patients were allotted left no space for us to do the deeply transformative work that one can do with a holistic medical provider and life coach. With a deep desire to be of service, to help people make sustainable change in their lives, I trained as a life coach and have been honored over the last almost-decade to do the work of helping others to live their best lives. What follows is more information about what coaching is and what to expect of our work together. Every coach has their own style and focus. My life coaching work is based in cognitive behavioral theory. I work with folks to help them learn strategies for recognizing the thoughts, feelings, and behaviors that they have created over a lifetime, and empowering them to shift those stories that may no longer serve them. All of us have developed thought and feeling patterns to help us survive and navigate our life circumstances. As we grow older, those same patterns that were so vital in helping us survive our younger days can get in the way of making the changes that can help us live our best life, here and now. Life coaching creates a framework to empower you to recognize that you no longer have to be at the mercy of old ways of thinking, feeling and acting – rather, you can learn to recognize and then begin to shift your thinking, reconnecting to your dreams and passions. This work leads to sustainable and lasting change. Unlike therapy, an incredibly helpful tool for many people, coaching doesn’t usually involve months of looking backwards at your early childhood. Instead, I work with people to take a peak at the past, while focusing on how old ways of thinking might be showing up in their current life, and getting in the way of making the kind of changes they really want to make. My focus is on future planning – on how can we work together to create new ways of thinking, that can lead to the feelings and behaviors that will truly feed your body and spirit. My role is to act as a guide, one who can help you see through the stories that you (and maybe others) have been telling you, and break down those old patterns so that you can rebuild them in more useful ways. I like to use the analogy of Legos. I believe that each of us came into the world with a fabulous, deluxe set of Legos, all the Legos needed to build the village of your dreams – or in other words, you have everything you need to build your most fulfilling life. But too often, as life happens, we lose track of our Legos, lose them under the couch, the dog eats them… and we come to think that we can only build the same small Lego house that we have always built. My job is to help you find those misplaced Legos and to remind you that you have all you need to build something amazing and new. A lot of this work is about quieting the stories you and others have told you so you can hear more clearly your own desires and vision. Then together, we can work on supporting you in recognizing and giving voice to your needs and wants, with less fear. What should I expect from coaching? In my experience, what helps people make these kinds of shifts is working with someone who models and provides loving and non-judgmental support, deep and attentive listening, and who asks really smart questions. This is the heart of my coaching practice. It’s not my job to tell you what to do, but to work with you and, by asking the right questions, to help you hear your own voice so that you can connect with what you need to do, to think and to feel to create the life you want. Coaching is very individual, and looks differently for different people. People come to coaching with a variety of concerns, from stress to fatigue to feeling “stuck” in life/love/work to wanting career support. Coaching is an amazing way to help you figure out the stories you are telling and how to shift them to create more breathing space in your beautiful world. Generally, I work with people weekly at first with the goal of moving to biweekly, and then monthly. Ultimately, I give you the skills to coach yourself, so you no longer need me. For example, I have been working with Elizabeth since 2008 – at first we worked together weekly, then, as she was able to coach herself with greater ease, we started to space our visits out to monthly, and then quarterly. She has been calling me every year on her birthday since 2009, and I look forward to that November 12th call each year. Sessions are 50 minutes long and are done over a secure video platform, which means you don’t have to schlep anywhere, which is great, and means that I can work with folks worldwide. I believe in homework, because I understand that these kinds of transformations are not just about our time together, but about making this work vibrant, present, and effective throughout your daily life and throughout your week. I give thoughtful assignments that help you deepen your thinking and, most importantly, practice in small ways the kinds of changes you want to see in your life. A lot efforts to change fail because folks try to do too much at once and/or don’t stop to look at the root causes and stories that are shaping their thoughts, feelings, actions, and wellness. I help you look at the broader context and causes of what might be getting in your way and then take what we call “Kitten Steps” (because sometimes even baby steps are too big!) towards integrating changes, so that our work together resonates and ripples throughout your whole life in a lasting way. I am also deeply practical and realistic. Don’t expect me to say “great to meet you, let’s change everything in your life all at once!” That doesn’t work, so we won’t do it. Instead we’ll co-create a plan that is doable, feasible, and workable with your life as it stands today. That doesn’t mean I won’t challenge you – not at all. It means that I won’t ask you do All the Things all at once – that’s a sure-fire to set yourself up for failure. One unique aspect of my coaching practice is my holistic approach in addressing a range of issues that affect both your emotional and physical health. As a Family Nurse Practitioner trained in Functional Medicine, herbalism, and public health, I have a deep understanding of how the body and mind are connected, and the ways in which your thinking may be impacting your choices about health, and vice versa. Our lives are complex and multi-faceted, and my training helps me to work with you to understand all of the things that might be impacting your health, and your choices about health. In my view, one of the problems with traditional, western medical care is that it focuses on symptoms. My training in Functional Medicine and life coaching are deeply complimentary, allowing me to explore with you the underlying causes and the broader context of your life as well as the ways your thinking, emotional health, and physical health are all connected. At the core of my values is the belief and knowledge that you are perfect just as you are, and that we all have what we need for our best health and wellness. Change is possible, and you already know how to do it. Maybe something has gotten in the way of you knowing those things, but working together, I know you can overcome the difficulties life has put before you, and that you can begin to live as you dream. 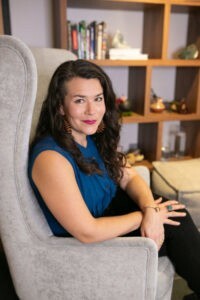 Victoria Albina, NP, MPH is a licensed and board certified Family Nurse Practitioner, herbalist and life coach, with 20 years experience in health and wellness. 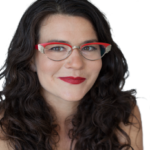 She trained at the University of California, San Francisco, and holds a Masters in Public Health from Boston University and a bachelors from Oberlin College. She comes to this work having been a patient herself, and having healed from a lifetime of IBS, GERD, SIBO, fatigue, depression and anxiety. She is passionate about her work, and loves supporting patients in a truly holistic way - body, mind, heart and spirit. A native of Mar del Plata, Argentina, she grew up in the great state of Rhode Island, and lives in NYC with her partner. A brown dog named Frankie Bacon has her heart, and she lives for steak and a good dark chocolate. Book a session with Victoria Albina now. 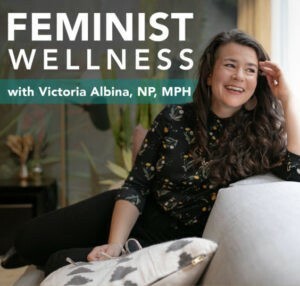 Victoria Albina is a UCSF-trained Family Nurse Practitioner, Herbalist, Life Coach. She has a Masters degree in Public Health from Boston University School of Public Health and a BA in Latin American Studies from Oberlin College. She has been working in health & wellness for over 20 years and has a passion for helping women to heal mind, body and spirit.